Here’s Piglet, the demure, soft-hearted, and slighted neat-obsessed closest friend of Winnie The Pooh. 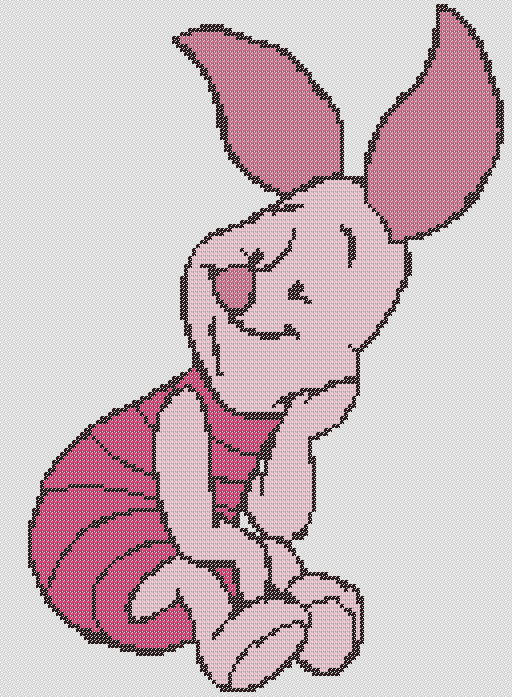 This sweet Piglet cross stitch simple pattern would be a wonderful choice fit for your kids’ first embroidery project, or other cross stitch project for your loved one. You can also use this cross stitch patterns free download for your upholstery design, pillow cases, bed spreads, and so many more. We’ll be bringing more Hundred Acre Woods characters as we go along. Disclaimer: “Piglet”, “Winnie the Pooh” character and its name the copyright, trademark and property of Disney Corporation and Dutton Children’s Books. All rights reserved. Cross stitch patterns found in this site bearing the Disney, Winnie The Pooh and Piglet names and images are for personal use only. Download Piglet (Winnie The Pooh) Cross Stitch zipped file (approx. 533kb — downloaded 221 times). The password for this download is “crossstitch4free” without the quotation marks.